WATCH: BOOM! MASAKIT BA? - Mainstream Media Nga-nga Sa Sagot ni Bb. Pilipinas Globe Michelle Gumabao! Q: What Can you do to fight fake news? A: I know that Fake News is very rampant now adays but inoder to fight this, we must first know what we are reporting, know what we are reading and at the same time be accountable for what we say especially online and I hope that media always filter the news resources to always deliver truth and authentic news! Iba talaga pag walang hawak na 'script' nagmumukhang mang-mang sa harap ng camera. I don't know but I feel Ces Drilon was expecting something else and might be trying to use the BB. 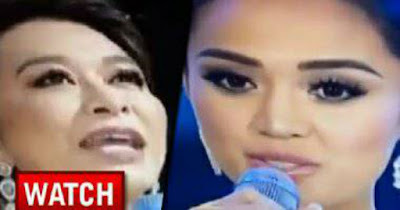 Pilipinas as a platform to...you know...e wala, sa kanilang traditional media bumalandra yung sagot ng contestant....wahahahaha! Go PRRD! Daniel Maravilla: Patama talaga sa biased media ang sagot ni Ate Michele! Akala kasi nila isi-single out nya ang mga DDS bloggers. Sorry Ms Ces Drilon you failed! Hahaha! Boom basag ang yellow mainstream media! hahahahaha dami ko talaga tawa sa question na to ni ces drillon. in fairness, michelle really did a great job in giving her answer. ano ngayon ces masabi mo filter nyo daw un mga news nyo pati ur sources of information. make sure deliver nyo daw un TOTOO balita indi sabi-sabi!!!! hahahahahaha clap!clap!clap! Zhussane SueCarno: Tingnan mo nga naman ang asenso ng mga reporter ng media, now they’re one of the judges na. Baka next time si sidewalk palengkera Doris Bigornia and Abnormal Pia cRappler na ang magtatanong. Sapul na sapul ang mga bayarang media. Shame on you! Manhid na mga yan kung nasan ang pera yun ang Balita.. ganyan na ang labanan. Dahil wala sila napapala na grasya galing kay PRRD doon sila sa may pera kapalit ang resources nila. Jess Ibot Balangue Villamor: This is the most accurate answer to this question well this lady knows and aware what happening in our society mainstream media started the fake news now we have social media now and bloggers they say where the spreading fake news shame on them they started fake news and black propaganda way back when.they are good in character assassination look what they did to marcos and the rest of his family they make the marcoses evil but who is most evil look now they can’t manipulate people now coz we have our own voice now the social media. Trending Balita: WATCH: BOOM! MASAKIT BA? - Mainstream Media Nga-nga Sa Sagot ni Bb. Pilipinas Globe Michelle Gumabao!